“A Midsummer Night’s Dream” cast members try on costumes. From left: Adam Fontana, Austin Hohnke, Elizabeth Gray, Misha Fristensky and Joey Panelli. For the cast of “A Midsummer Night’s Dream,” summer started in a costume trunk. On June 4, the summer company of Merely Players arrived from all over the country. Recruited by Director Mona Wood-Patterson, seven of her eight actors are following different professional paths. Once, they were all drama students at Durango High School. In early June, they flew or drove from New York City, Pittsburgh, Provo, Seattle and elsewhere to convene with friends to “make art together,” as Wood-Patterson says. Originally to be staged at the James Ranch Terraces and displaced by the 416 Fire, the Mainstage Theatre at Fort Lewis College will host Wood-Patterson’s vision of Shakespeare under the stars. “A Midsummer Night’s Dream” will open June 22 and run eight performances through the end of the month. In the original Shakespearean story, aristocratic Athenians mix with a group of working-class well-wishers and magical woodland fairies. Theseus, Duke of Athens plans to marry Hippolyta. Their wedding festival is in the offing. Peter Quince and Nick Bottom assemble their buddies to craft a play for the Duke’s entertainment. Four young lovers further complicate things, especially overnight in the woods. The King and Queen of the Fairies complicate things, but all entanglements sort themselves out in the end. Every actor plays multiple roles, a challenging task for the players, costumer JoAnn Nevils and the director. At the first rehearsal, Wood-Patterson, Nevils and the cast dove into boxes of wigs, dresses, doublets, scarves and animal suits. Misha Fristensky (Puck/Peter Quince) put on a cream fedora and an electric-pink linen suit. Austin Hohnke (Theseus/Nick Bottom) strode out in a formal white dinner jacket. Landon Newton (Oberon/Egeus/Francis Flute) slithered into a faded rose ball gown and asked cast members to vote which wig of four best fit the dress. Elizabeth Gray (Hippolyta/Titania/Snug) swanned through the rehearsal room in flowing chiffon then made a quick change into a fake fur bear costume. 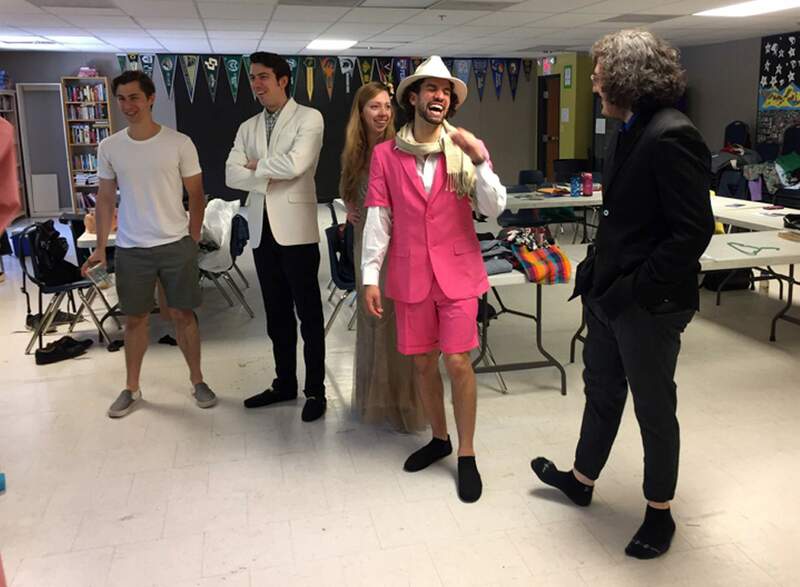 Before they appeared on the makeshift runway, Amanda Arcomano (Helena/Peaseblossom), Joey Panelli (Demetrius/Starveling/Mote) and Adam Fontana (Lysander/Tom Snout/Cobweb) admired their colleagues in the first costume round. All Durango High School graduates, the seven core members have been joined again by new colleague Erika Vetter (Hermia/Philostrate/Mustardseed). She’s soon to be begin graduate studies in acting in Seattle. Vetter also happens to be Fontana’s wife. Intertwined with and indispensable to all the actors, Stage Manager Maggie Arbeeny has returned to Durango once again from Olympia, Washington. She’s now a special education teacher. It’s a rare occurrence to continue to put summer shows together with one’s former high school drama teacher. Wood-Patterson has maintained contact with many former students while she continues to foster a creative community of her own. What: “A Midsummer Night’s Dream,” a comedy by William Shakespeare, performed by Merely Players, directed by Mona Wood-Patterson. WHEN: 7 p.m. June 22, 23, 24, 26, 27, 28, 29 and 30. WHERE: The Mainstage Theatre at Fort Lewis College. TICKETS: $26 general, $13 for fire evacuees (must bring paperwork), free for firefighters. Available at the ticket office inside the Durango Welcome Center, Eighth Street and Main Avenue, online at www.durangoconcerts.com and by phone at 247-7657. MORE INFORMATION: Meet the Actors Party package also available for an additional $20 after the show on June 23.